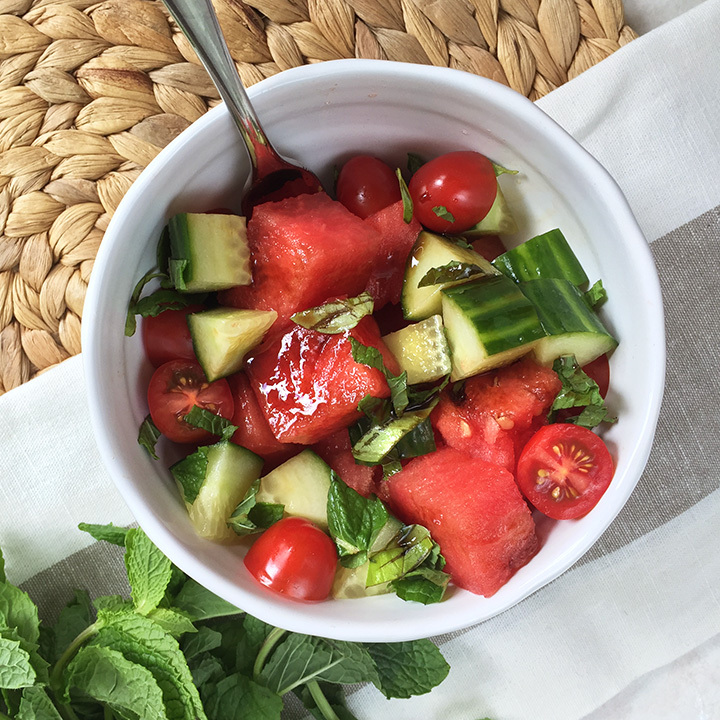 It’s summer in full swing which means loads of fresh produce with little effort, right?! That’s been my motto anyways. I feel way more like a prep cook just slicing and dicing. I also have a wedding I’m bridesmaiding in a matter of days so all baking and sweet dishes are going to have to wait till after. Let’s just say I’ve been scheming an ice cream dessert for quite a while I hope to attack. Oh and that breakfast cookie I teased everyone with on instagram. Watermelon has been so incredible these last few weeks and my family has already eaten three whole ones. The girls devour it. I’m an overachiever myself. This salad has made it especially wonderful. It’s a play on an appetizer a friend of mine introduced me to years ago that included buffalo mozzarella. That would also make a great addition to the salad if you can eat cheese. That or feta or ricotta salata.